Dallas/Ft. Worth, TX - Carried by the joy with which the risen Lord had brought to mankind with His glorious victory over death, the Serbian Orthodox community in Dallas/Fort Worth, Texas had one more reason to rejoice – the consecration of their church, the center of their spiritual, liturgical-eucharistic gathering and life. Without the church, God's home of communal prayer, it is difficult and nearly impossible to preserve an Orthodox community in true faith, this applies especially to the North American continent, because of the dispersiveness and the great distance between the Serbian church communities, separated hundreds of miles from one another. 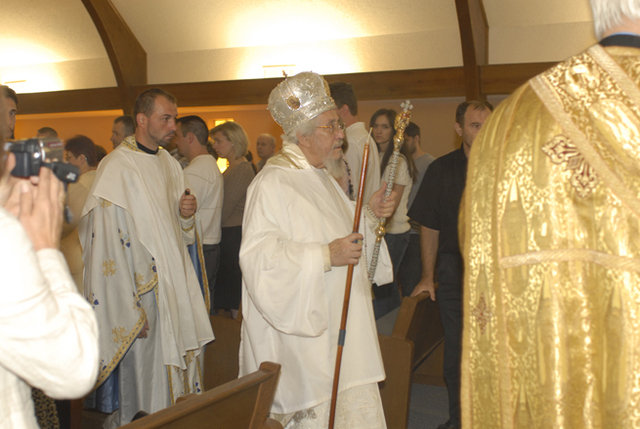 The Serbian church community in Dallas is the third organized church community in Texas. The first and oldest church community is Sts. Constantine and Helen in Galveston, established in 1895; the second, St. Sava in Houston, established by decision of Bishop Firmilian of Midwestern America on November 27, 1979 and the third, Holy Three Hierarchs in Dallas, Texas established on May 1, 1999, by decision of His Eminence Metropolitan Christopher of Midwestern America. 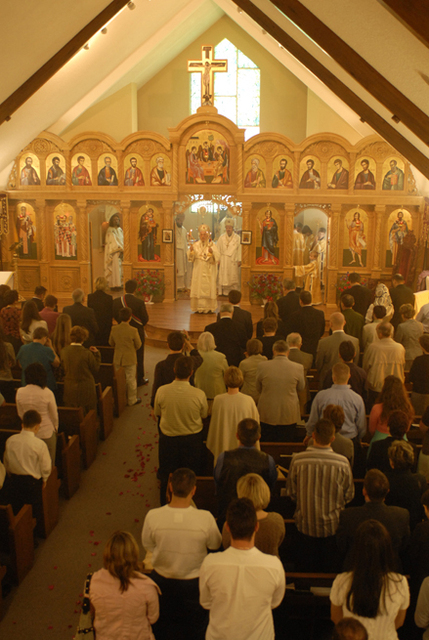 The closest organized parish to greater Dallas is the St. Sava parish in Houston. The priest in Houston, Fr. Dejan Tiosavljevic, was in the position to contact the Orthodox Serbs who had settled here and offer them spiritual care for all their needs. Seeing a great desire that the members of this Serbian community showed in organizing a parish for greater Dallas Fr. Dejan sensed, though still young in his parochial duties, in this desire a calling and challenge. 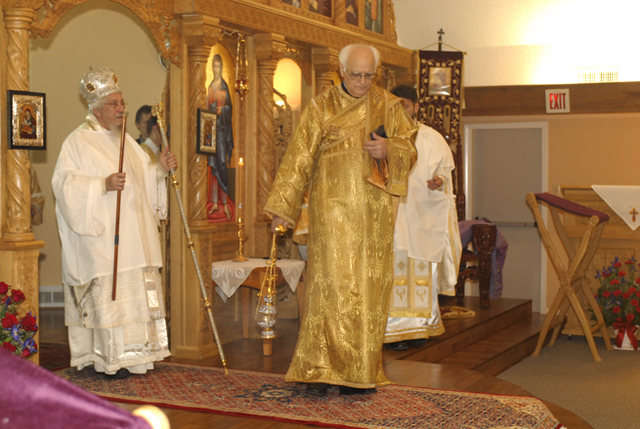 He informed his ruling hierarch, Metropolitan Christopher, and invited him to Dallas on January 30, 1999 to served the Divine Liturgy for the Orthodox Serbs and to take part in the St. Sava program which the parishioners had organized for this occasion. 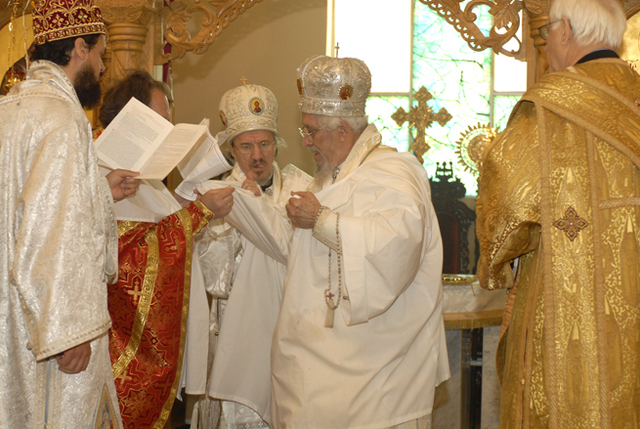 Following this historic meeting with their hierarch came the written petition, with forty signatures, for forming a Serbian Orthodox parish in Dallas/Fort Worth, Texas on March 6, 1999, completed on April 22 with the names of the future parish Trusteeship. Metropolitan Christopher confirmed the wish of the faithful, in accordance with the constitution of the Serbian Orthodox Church in America and Canada and made the decision in which he stated, among other things: “...We are establishing the Serbian Orthodox parish in Dallas/Fort Worth as an integral part of the Serbian Orthodox Metropolitanate of Midwestern America, with headquarters at the St. Sava Monastery in Libertyville, a part of the Serbian Orthodox Church with its patriarchal see in Belgrade.” With this written Act Metropolitan Christopher appointed Fr. 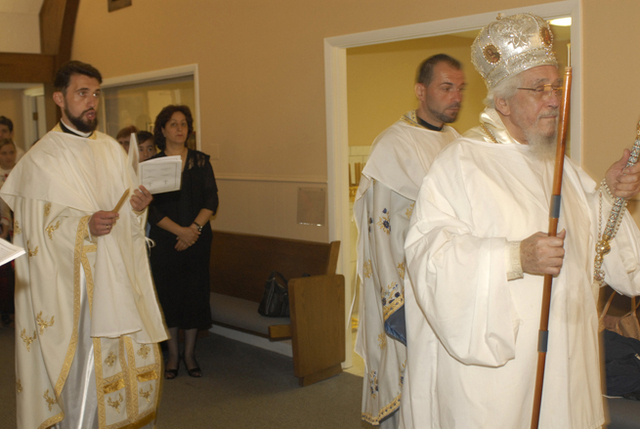 Dejan Tiosavljevic as the first administrator of this newly-established parish in Dallas. Simultaneously, the first Trusteeship was appointed headed by Fr. Dejan. Besides the priest the Trusteeship was made up of: Rajko Simic (co-chairman), Zoran Draganic, Frank Babic (secretary), Tony Anthony Cuk (treasurer), Sladjan Maksimovic (financial treasurer) and members: Robert Palmer, Dragan Jovanovic and Nikola Milakovic. After a year since he had been appointed in Dallas, Fr. Milan, with the help of the Trusteeship, decided to purchase a piece of property with a home and a small building which was later converted to a chapel. The chapel was dedicated to the Holy Three Hierarchs: St. Basil the Great, St. Gregory the Theologian and St. John Chrysostom. 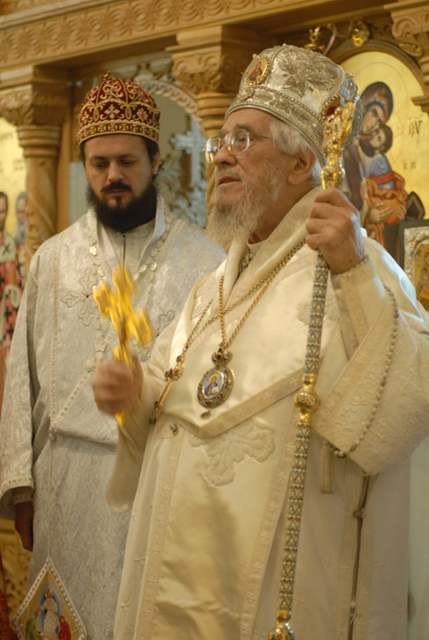 Metropolitan Christopher blessed the chapel on the day of the Slava, February 12, 2003. The chapel is located in the suburbs, in Irving. Already in 2004 Fr. Milan began work in building a newer and larger hall with a chapel. Construction was completed in March of 2005 and it was blessed by Metropolitan Christopher on May 10, 2005. The entire property, together with the aforementioned buildings were purchased through the donations of Mr. Dragas and Mrs. Denise Belcevic. Due to unresolved administrative questions related to the property in town of Irving, the Trusteeship sold the property for $435,000 and new property was purchased with a Baptist church on the property, together with a parish home and a hall for $800,000. Mr. Dragas Belcevic gave the church an interest free loan to purchase the property. In September 2006 the parish moved to the new church center. Meanwhile, Fr. Milan went into retirement and moved to Australia. He remained a member of the Metropolitanate of Midwestern America. After Fr. Milan went into retirement a young priest, Fr. Ljubinko Savic, was appointed to the parish. Fr. Ljubinko was born in Priboj in 1975 of parents Dragoljub and Radinka. He completed the St. Arsenije of Srem Seminary in Sremski Karlovci. After finishing the seminary he continued his studies at the Spiritual Academy of St. Basil of Ostrog in Srbinje and then in Thessalonica in Greece. 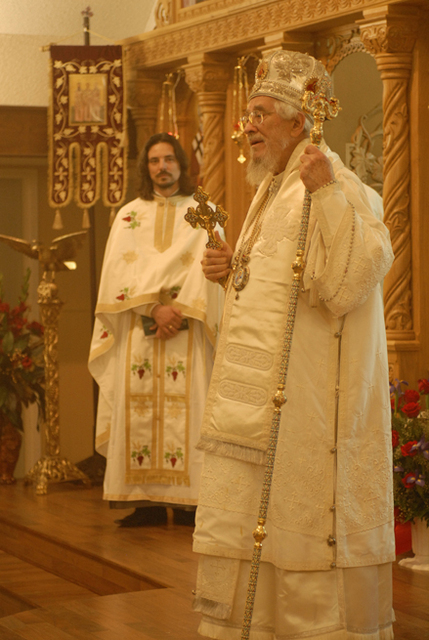 He was ordained on August 28, 1999 by Metropolitan Nikolaj of Dabrobosna. The Trusteeship, together with Fr. Ljubinko and Mr. Dragas Belcevic as co-chairman begin a new page in the history of the Serbian church community in Dallas. The foundation that was laid by Fr. Dejan Tiosavljevic, continued and confirmed by Fr. Milan Zbiljic was crowned by a significant and God pleasing act. Namely, the completion of the Serbian church center during the tenure of Fr. 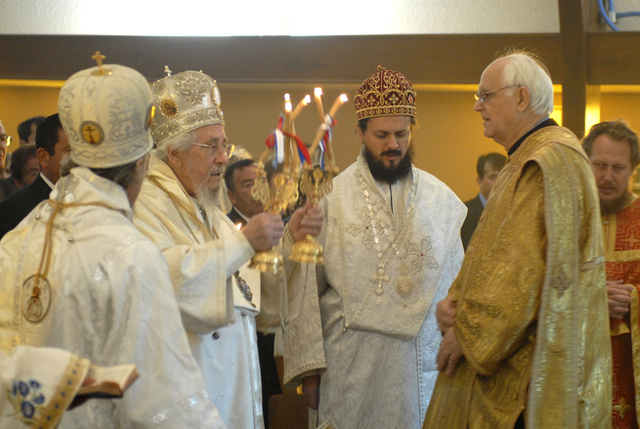 Ljubinko Savic and the great benefactor Dragas Belcevic during the consecreation of the church, May 2 and 3, 2008. The Church of the Holy Three Hierarch in Dallas was build in the spirit of the Western church architecture, unfamiliar to us from Orthodox countries, but with much effort and renovation the exterior received a new, Orthodox look, becoming more familiar to us. The interior of the church changed with the addition of the iconostasis, adding a warmth to the prayerful atmosphere which the faithful experience in Orthodox churches. The carved iconostasis was completed in the “Heruvim” workshop in Trstenik, Serbia by Jovan Veinovic. The icons on the iconstasis were completed by Bata Ninkovic from Belgrade. Here we respectfully and with much gratitude mention the names of the donors who have given significantly for the realization of this God pleasing act. Besides Dragas and Denise Belcevic, Nena Manojlovic and Rajko together with his wife Zaga Simic, Milica Tomic and all other faithful of the Serbian Church of greater Dallas. 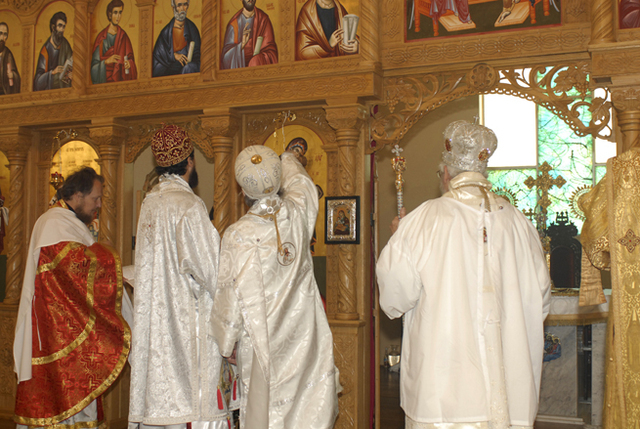 The consecration festivities began on Friday May 2, 2008 with a Vigil service with His Eminence Metropolitan Christopher of Midwestern America, the ruling hierarch, Bishop Mitrophan of Eastern America and Bishop Maxim of Western America in attendance. The Vigil was served by: V. Rev. Milan Zbiljic, who traveled from Australia for this occasion, V. Rev. 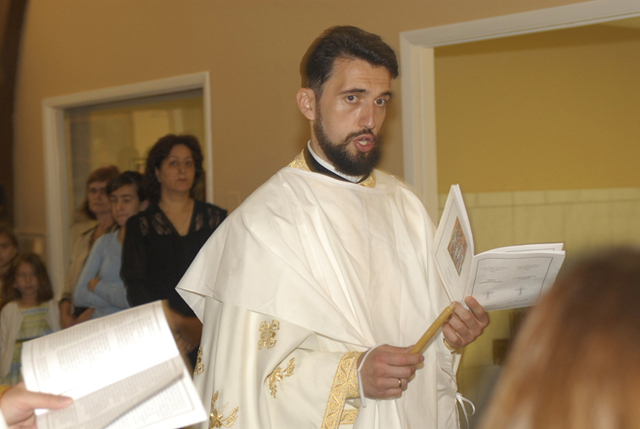 Aleksandar Bugarin, parish priest of St. George Serbian Church in Kansas City, Fr. Sasa Petrovic, parish priest of St. Nicholas Church in Omaha, Fr. Serge Veselinovic, parish priest of Sts. Constantine and Helen Serbian Church in Galveston and the local priest Fr. Ljubinko Savic, assisted by Protodeacon Stanimir Spasovic. Following the Vigil service was the blessing of the church hall by Bishop Mitrophan. Following the blessing of the hall, the bishop addressed the many faithful in attendance with his warm, archpastoral words, praising them for their faith and calling them not to grow weary in doing good works for their church. The next day, on Saturday May 3, 2008, the church was consecrated after which the Holy Hierarchical Divine Liturgy followed immediately in which His Eminence Metropolitan Christopher officiated with Bishops Mitrophan and Maxim. At the Divine Liturgy the clergy who had served the Vigil con-celebrated with the hierarchs, joined also by Fr. 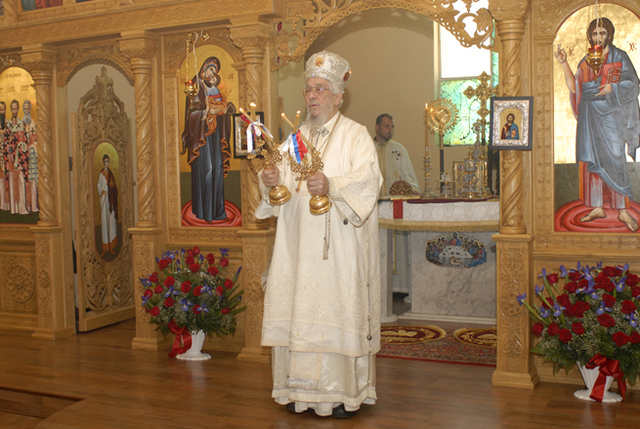 Dejan Tiosavljevic of the St. Sava parish in Houston, the first administrator of this parish. Bishop Maxim, in his thoughtful archpastoral message delivered the homily to the large number of faithful in attendance. The relatively small Holy Three Hierarchs Church Choir added to the beauty of the service with their beautiful singing. A banquet was prepared in the church hall after the liturgy. Words of congratulations were offered by Metropolitan Christopher, Bishops Mitrophan and Maxim, Fr. Ljubinko, former priests Fr. Dejan and Fr. Milan as well as Rajko Simic and Dragas Belcevic. At the end of his greeting Dragas Belcevic, thrilled by the great and significant success, the consecration of the church, the house of prayer, the center of the eucharistic community of the faithful of greater Dallas, made a moving gesture on this occasion of donating $100,000 for future work and adornment of the church. The consecration of the church and the celebration prepared on the occasion of this event will remain in the memory of the parishioners as well in the history of the Serbian Church in North America as well as the history of the Serbian Church in general as a very significant and joyful event.